Ralph Nader begins his new book, Only the Super-Rich Can Save Us!, with an author’s note that attempts to clarify any genre confusion the reader might have. “This book is not a novel,” he announces. “Nor is it nonfiction. In the literary world, it might be described as a ‘practical utopia.’ ” It’s a smart clarification to offer because, by the aesthetic criteria of either of those two more common forms, it is a colossal, Hindenburgian disaster. As a novel it is a dismal affair: gracelessly written, ploddingly plotted, and long. Oh God so long. And as a political tract it advances a conception of politics both grossly condescending and depressingly elitist. Democracy, Nader seems to say, could be ours: if only the oligarchs would get behind it. The group begins fomenting a progressive reformist movement along dozens of tracks: creating an alternative to the reactionary Chamber of Commerce; putting pressure on Wal-Mart to allow its workers to unionize (partly by buying up local competitors and subsidizing them to undercut Wal-Mart’s prices); founding a Clean Elections Party to challenge congressional incumbents; and galvanizing public opinion with organized lunch demonstrations and publicity stunts like running corporations for public office and proposing the pledge of alliance be amended so that it ends, “With liberty and justice for some.” Oh yeah: and Warren Beatty runs for governor of California. The ultimate aim is to pass a slate of transformational reform legislation through congress, (“The Agenda”) that will clean up politics, humanize the economy and usher in a new more democratic progressive era. I won’t spoil the ending by telling you if they succeed. Most, though not all, of the “Meliorists” programs are worthy, even ingenious. And if I were a funder, and I read them described in a grant application, I’d be inclined to reach for my checkbook. But the proffering of proposals and implementation thereof is hardly the stuff of gripping narrative. So Nader is left to spool most of the tale out through a series of reoccurring meetings, in Maui and elsewhere, where details of progress on the various fronts are reported and discussed. If you’ve ever thought to yourself that the fiction you’ve been reading doesn’t contain enough in-depth accounts of what people said at meetings, then this book will be a revelation. Those words are uttered by the Bill Cosby character. Now the real Bill Cosby happens to be a fascinating person whose politics are difficult to pigeonhole. But he sounds nothing like this. Fine, you say, it’s a work of fiction, but the problem is that no one talks like this — “From such ferments rise great social movements” — except maybe Ralph Nader. Which raises the question: what is the point of inventing dozens of characters only to have them all more or less mouth the same convictions, perspectives, and platitudes in the same uncanny progressobot voice? You might as well just say what you want to say and spare us the pretense. Part of this is due to the fact that Nader simply never bothers to really write a genuine scene. Almost all of the action happens offstage. Nader never shows when he can tell. This literary failing connects to the book’s fundamental political failing, which is its conception of progressive political change as something that can happen because a bunch of very bright, rich, and powerful people get together and decide they want to see it happen — plotting it out and then executing it as one might a lavish retirement party. While there may be hiccups, there is no struggle. Sure, it’s a utopia, but it’s supposed to be a practical one, and in the real world conflict, heartache, and grinding struggle are irreducibly part of the long human march towards justice and equality. You can’t create an alternate universe in which that isn’t the case and still pretend it has something to teach us. In this book Nader has, to invoke the old joke about economists, assumed a can opener. The country has grown so oligarchic, so corrupt, and the interests that oppose reform and progress so entrenched, it is tempting to look for short-cuts, which is, ironically, what this 800-page book describes. 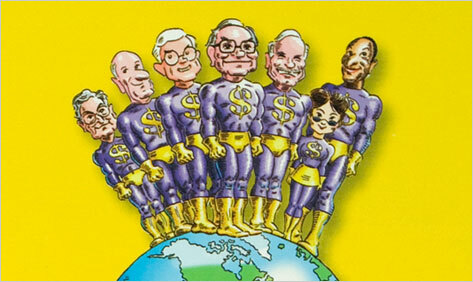 Only the Super-Rich Can Save Us! is meant to inspire, to show that another world is possible, that change could happen here, now, in our lifetimes. But its effect on me was just the opposite. Emma Goldman famously said, “If I can’t dance, I don’t want to be part of your revolution.” Well, if have to listen to invented self-important gas-bags drone on portentously for 800 pages in Nader’s voice, I don’t much want to be part of his. Christopher Hayes is Washington Editor of The Nation.